PDF Reader Pro is a PDF management software designed to help users manage, edit, and read PDF files on any platform or device. It enables users to perform tasks such as annotating, filling up forms, and encrypting PDF files on their Windows and Macs as well as their Android and iOS phones and tablets. PDF Reader Pro is a robust and blazingly fast PDF management program with an impressive set of functionalities. Aside from editing, reading, and annotating PDF files, users can also combine multiple PDF forms, affix digital signatures, convert, and put watermarks. Readers accessing PDF files in dimly-lit environments need not worry about manually changing the configurations. PDF Reader Pro comes with the Night Mode feature, adjusting the brightness of the screen to ensure an enjoyable reading experience even in a dark environment. 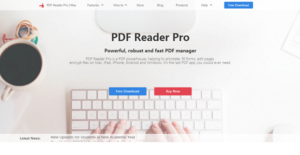 PDF Reader Pro has a complete set of functionalities that simplifies and accelerates all your PDF-related tasks and processes, making it the “Last PDF App you ever need”. This PDF reader enables you to read, edit, annotate and sign PDF files regardless of the device you are using. Whether you are using an iPhone to create a PDF document or signing a PDF contract with your Android device, PDF Reader Pro lets you do all the thing you need to do effortlessly. Other features include split and merge, export annotation, multiple conversion support (PDF to Image, Image to PDF, PDF to TXT, PDF to HTML, etc.). It is certainly not comfortable reading PDF documents (or any other documents, paper-based or digital) in an environment with inadequate lighting. Such activity is certainly uncomfortable and can put a strain on your eyes. With PDF Reader Pro, you can read your PDFs in dark environments without worrying about your eyes or comfort. The app has a Night Mode functionality that automatically configures the lighting of your device so that you can read, edit, sign, and annotate your PDF documents even in dimly lit situations. What Problems Will PDF Reader Pro Solve? If you are considering PDF Reader Pro it might also be sensible to check out other subcategories of Best Office Software gathered in our base of SaaS software reviews. Every business has its own characteristics, and may call for a specific Office Software solution that will be fit for their business size, type of clients and staff and even specific industry they deal with. It's not wise to count on getting a perfect app that will work for each company regardless of their history is. It may be a good idea to read a few PDF Reader Pro reviews first and even then you should pay attention to what the service is supposed to do for your business and your employees. Do you require an easy and straightforward service with only elementary functions? Will you actually use the advanced tools required by experts and large enterprises? Are there any specific tools that are especially useful for the industry you operate in? If you ask yourself these questions it will be much easier to find a solid service that will match your budget. How Much Does PDF Reader Pro Cost? We realize that when you make a decision to buy Office Software it’s important not only to see how experts evaluate it in their reviews, but also to find out if the real people and companies that buy it are actually satisfied with the product. That’s why we’ve created our behavior-based Customer Satisfaction Algorithm™ that gathers customer reviews, comments and PDF Reader Pro reviews across a wide range of social media sites. The data is then presented in an easy to digest form showing how many people had positive and negative experience with PDF Reader Pro. With that information at hand you should be equipped to make an informed buying decision that you won’t regret. What are PDF Reader Pro pricing details? What integrations are available for PDF Reader Pro?